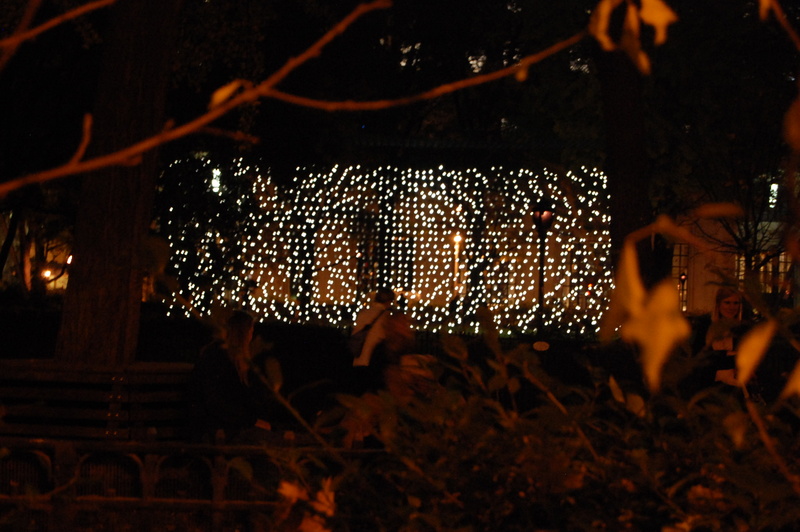 Finally caught Jim Campbell’s amazing light sculpture in Madison Square Park entitled Scattered Light last night and it was something to relish and appreciate. Look closely and you will see shadowy human figures walk through a rectangle of hanging light bulbs and reveal movement. I spent about 45 minutes walking in the park, on Madison Avenue and Broadway trying to see it from every angle and take adequate pictures. Not sure that happened. Here is a short video of Campbell’s piece captured by This Week In New York which will give you an idea, but it’s best experienced in person. I love that it’s only really alive in the dark, as the sun has set, as the bus-revving bustle of city day transfers from working to walking, from the go-go-go of the day to going elsewhere as day has subsided. Having walked through this park a billion times with its proximity to my former job, I know this feeling well, and was caught up in how well it reflected these moments of time visually. A walk through a small park with a touch of nature while the controlled chaos of confluence flows near the Flatiron and downtown. I found the best viewing angle to be on Broadway on the East side right outside of the dog walk where the fullness of the figures were revealed and the hustle in front, behind and within the park mimicked the action within the open rectangle. It’s really only viewable on the sides, so if you’re sitting and enjoying a Shake Shack burger outside, you can see one end of it, but not actually get the experience. Campbell, trained at M.I.T. as an electrical engineer, pared down the video file into a set of very high-contrast images, and downloaded that information to custom-built circuitry (feeding five miles of wire) that switches lights on and off. The programming had to be “very precisely” tuned to the distance between lightbulbs, to give the movements realistic shape and speed. If you are over in that area, stroll over to Broadway and pause a few minutes to watch. Well worth the renewal. Then, go blow your paycheck at Eataly. Talk about a confluence of chaos. Still good though Not in the mood for crowds and tourists? There’s also yummy fried chicken at Hill Country Chicken close by.